The general public unwittingly donated thousands of pounds to a group of men planning to carry out suicide attacks in Britain, a court has heard. Three Birmingham men posed as collectors from a genuine charity - Muslim Aid - and went door-to-door in the city and Leicester, it heard. But the charity received a fraction of the money, Woolwich Crown Court heard. 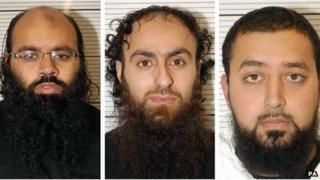 Irfan Naseer, 31, Irfan Khalid, 27, and Ashik Ali, 27, deny engaging in conduct in preparation of terrorist acts. The court heard detectives found notes which suggested they had collected £12,100 but lost £9,149 of it after engaging in foreign currency trading. Brian Altman QC, prosecuting, said the men wore Muslim Aid T-shirts and tabards to "beguile the public into believing this was legitimate charity collecting, when it wasn't. "That money was stolen and... was not intended by the defendants to be used for any other legitimate purpose other than terrorism." On the opening day of the trial the jury was told two of the men had received terror training in Pakistan and the trio planned to set off a series of suicide bombs in an attack which prosecutors said would have dwarfed the 7 July 2005 bombings in London. Mr Altman said the collections took place after Mr Naseer and Mr Khalid returned from training in the Taliban stronghold of Waziristan, in Pakistan, in July 2011. Mr Altman said Muslim Aid had had a licence for collecting door-to-door on a day in August 2011 but Mr Ali, Mr Naseer and Mr Khalid illegally collected cash over a longer period without the charity's knowledge. Mr Altman said they gave £900 to a madrassa, or religious school, in Bordesley Green, Birmingham, and kept the rest to finance their terror plot. The jury has already been told that 12 people were arrested in September 2011 and six men had pleaded guilty to preparing for acts of terrorism. The court has heard that one of the men who had pleaded guilty, Rahin Ahmed, had taken charge of more than £13,000 which had been raised by the group when they posed as legitimate charity workers. On Tuesday the court heard how the trio were caught, in covert police recordings, as they drove around the Small Heath area of Birmingham after one of their cars was bugged. Mr Altman said it was a "very telling exchange" which he said made it clear they were thinking of becoming suicide bombers. He said Mr Khalid said: "Nah, I'm just thinking... most likely it'll be Handsworth (cemetery), if there's a body left." Mr Naseer replied: "One thing, one thing, remember, once that once you done, it doesn't matter where you get buried, innit." Mr Khalid and Mr Naseer also talked about the Small Heath area becoming a "little war zone". Mr Khalid was recorded saying: "This earth here ain't ever be the same, how these people think that, all everyone's gonna be merry merry kuffar (non-Muslims) are gonna come and eat and drink here, it's not gonna happen, because after we've done, inshallah, yeah, after later on, yeah. "These people are gonna be getting killed and that here, there's gonna be little war zone, yeah," he added. The court heard they also talked about being dead by the time a MOT certificate for a Volkwagen Passat ran out in June this year. Mr Khalid was heard to say "we're dead by then", adding "we're probably out of here by next June, brother". In the recordings they go on to talk about being imprisoned under the "2005 Act" although the prosecution claimed they were referring to the Terrorism Act 2006 but got the date wrong. Mr Altman said: "It confirms that they knew full well what had been done was criminal." Later Mr Naseer, who was described as the group's "emir" (leader), replied: "(I) don't want to be shaheed (a martyr) yet yeah." In the recordings the men also reportedly talk about putting blades on the front of a lorry and "running" into people, the court heard. The jury was told Mr Ali registered two accounts on eBay's charity website "half in jest" in September 2006 with the user names "terrorshop" and "shopterror". Mr Altman said one of the accounts was closed down by eBay in October 2006. He said: "The second account remains active, but, like the first, has never been used. However, both reveal his mindset even then, even if the usernames he chose were registered half in jest." Mr Naseer denies five counts, Mr Khalid four and Mr Ali three, all between Christmas Day 2010 and 19 September 2011.